One of our favorite clients called us this summer with a question. He wanted to know if we’d shoot a video for a local non-profit in Statesville, North Carolina, called Fifth Street Ministries. We said yes and roped in Alex LaCasse, our favorite videographer, who was up for some pro bono work. 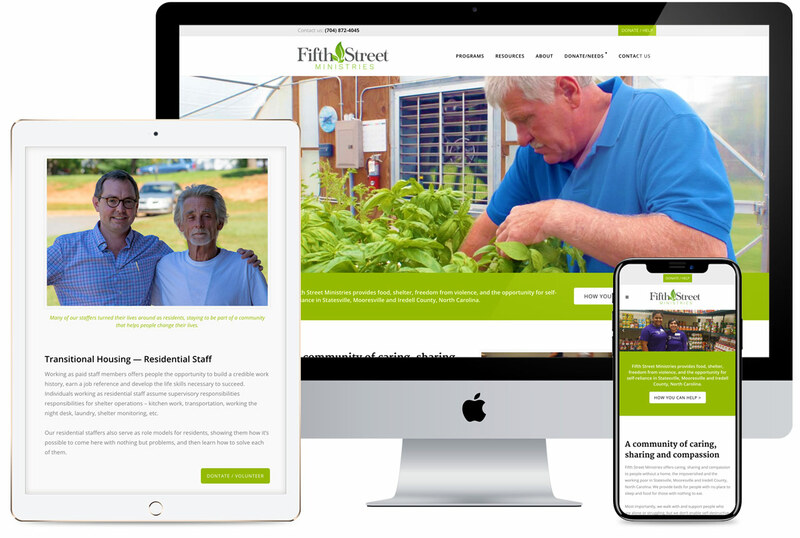 Once we started talking about the video, it became apparent that Fifth Street could also use new branding and a website, so we added both items to our to-do list. Fifth Street Ministries serves the homeless, impoverished and working poor in Statesville, Mooresville and Iredell County, North Carolina. They provide beds for people with no place to sleep and food for those with nothing to eat. Their programs include a night shelter, a community kitchen that serves over 94,000 meals a year (three meals a day, 365 days of the year), transitional housing, a clinic, clothing closet, shelter for victims of domestic violence, housing for homeless veterans and the Path House — a place for the homeless and people struggling with mental illness and/or addiction, who may not be ready to ask for or accept treatment and counseling. Fifth Street’s success is evident in the number of people they help, including former residents who turned their lives around and decided to stay, to help other people in need. Looking back on last summer’s video shoot, we still marvel at their strength. They told us about their struggles with unflinching candor, strength and grace. Having conquered their demons, they can empathize with the people who show up at Fifth Street every day, and more importantly, inspire and encourage them to win their own battles. If you have a minute, check out the new site (fifthstreetministries.com) and video (below). And if you’re in Statesville, Mooresville or Iredell County, think about supporting Fifth Street Ministries. Their work continues and they can always use donations and more volunteers.